Planning is such an important part of my life. I have really had to learn how to balance out all of the demands that I face on a day to day basis. I am first a wife and mother, but I am also a daughter, friend and employee. I truly feel that my weekly planning sessions help me stay on track and focused. 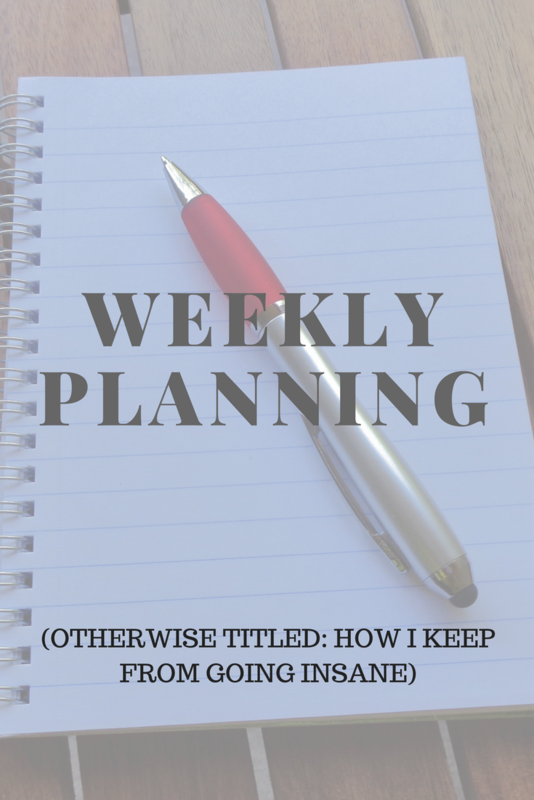 I usually have 2 major planning sessions each week. I do all of my meal planning on Thursday/Friday and my weekly planning on Sunday. I live in a small town (1200 people) that has 2 grocery stores. I almost exclusively shop at the one store, because you can have a grocery cart and cruise it up and down the aisles. The other store is much too small to allow carts so you have to take a basket (or 2!) around to gather your groceries. I almost always have my daughter in tow, so the store with the carts is easiest for me. I have access to the flyer on Thursday night. I go through the flyer and write down everything that we need. I always shop sales because I truly could not afford to grocery shop in my town if I didn't! I make out my grocery list Thursday night and I go get my groceries Friday. The sales start Friday and the truck comes Friday. I never wait until Saturday, because they will often sell out of things that I want by then. When I get home, I plan my meals around the groceries that I bought and the items that we have on hand. I try to do a freezer inventory now and then, because we often have much more than I think we do! When planning, I note anything that we have scheduled during the following week. I save time-intensive meals for when I know I will be home all afternoon. I write our meals on the dry erase board that hangs on our fridge. I also write the plan in my daily agenda. Meal planning saves me from having to think about what to make for supper after a long day at work. It also helps to keep my spending in check. In total, my meal planning usually only takes 10-15 minutes of my time. On Sunday evenings, I sit down with my agenda and phone and go through the calendars. Hubby and I use a shared calendar app and I like having my paper agenda for writing our schedules and small to-do lists. First, I go through the app and the agenda to make sure that they both have all the same events. Sometimes when we are scheduling items, the event will make it onto only 1 of the calendars. After I know that both schedules are the same, I will write in any to-dos or reminders on my agenda. This often only takes 5 minutes but it can be invaluable to our week. The household runs much more smoothly when everyone knows what to expect of the week ahead. How do you plan your weeks? Have you embraced meal planning? I would love to hear your thoughts and ideas! Leave a comment below! I have never done meal planning but totally should!! I go in spurts where I plan well and others when I neglect it completely. I'm in the latter at the moment. Eek! I absolutely agree! I can't function without my planning sessions! They are so important in order to keep things running smoothly!